It’s that time of year when the sun finally comes out and temperatures go up, allowing you to get some outdoor planting done. But beware the fickle Chicago spring. Don’t let frost take out all of your plants (and hard work). Cover less hardy plantings or move them into sheltered areas this weekend when temperatures dip below freezing. Perfect gardening days are sometimes followed by colder temperatures that can wreak havoc on your newly installed containers. 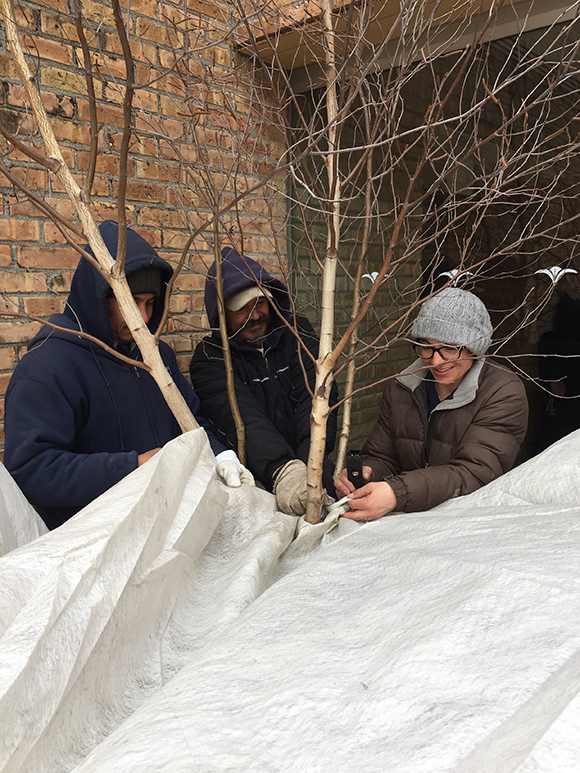 Here at the Garden, we’ve just begun installing our spring annual displays, but we have to protect them from colder days on the horizon. Horticulturist Heather Sherwood shared some of the things she’s doing to protect plants that the home gardener may want to do as well. Move containers inside. Sherwood’s team recently planted large containers with a mix of flowers, including foxglove and Persian buttercup. They’re just outside the English Walled Garden now, but they’ll be moved into McGinley Pavilion, which currently has plastic draping down to keep the cold out. If you’ve started to create containers for your back porch or balcony, bring them inside. Even an uninsulated shed offers more protection than none. Not all containers are easy to relocate indoors. Some of our spring annual display containers weigh more than 200 pounds, and will stay where they are through the cold. Sherwood will cover the ones that can’t be moved with plastic, including used soil bags. If you were planning on just disposing of your empty soil bags, reuse them this way to protect your containers instead. Sherwood also recommends covering plants with old bedding, especially fitted sheets. They fit snugly around the bottom of the containers and keep out the cold air. If you do cover your containers, it may be helpful to prop up the covering with bamboo poles. The covering shouldn’t touch the plants, because it can weigh down and crush any leaves or fresh blooms. And if the temperatures drop too low, the covering can freeze to the plant and damage it. Circulation is always good, so give your plants “breathing room” if you cover them. Leave some plants alone. Some flowers don’t need your fretting. Pansies will likely withstand colder temperatures. Daffodils and tulips, some of which haven’t even emerged yet, will probably also be fine. Focus your efforts on protecting the more vulnerable flowers and let the hardy ones tough out the cold. 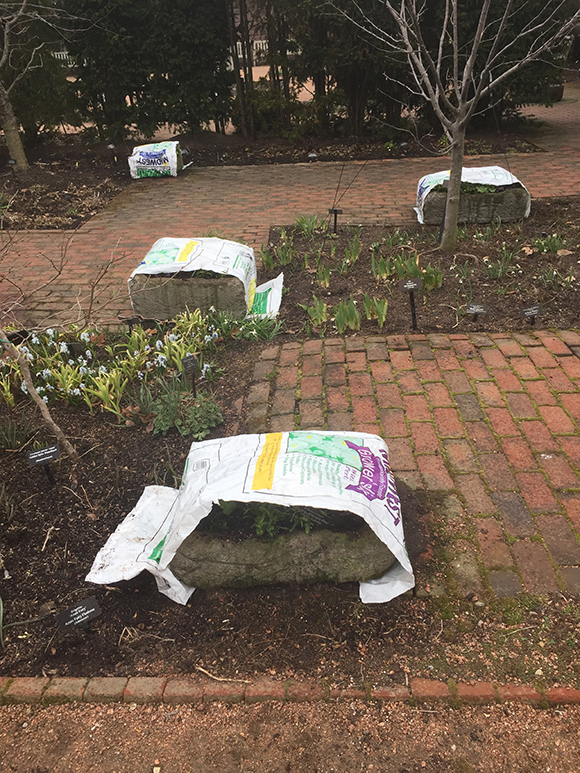 Container plantings in the English Walled Garden are covered lightly with soil bags. Heavier frost blankets are stapled around tree trunks to protect displays around the Regenstein Center. Still not sure what to do with your containers? 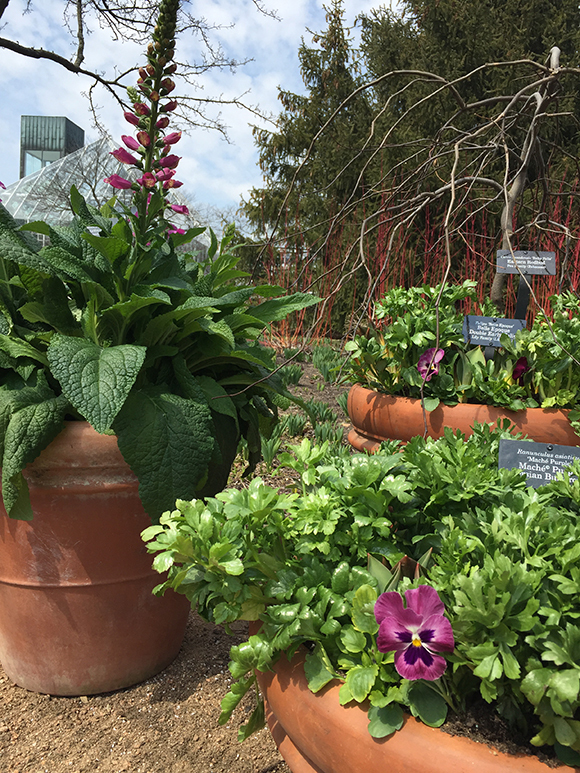 Contact Plant Information here at the Garden at (847) 835-0972 or plantinfo@chicagobotanic.org with any questions. The master gardeners and horticulture specialists who run this service can help you figure out what’s best for your plants. Great hits for maintaining tender plants!